the rock of Venus, but more temperate. of palm’s cascade from shoulder to hip (so trim). Oh love, I shan’t compare you to a summer’s day. This is very much of a draft poem, but I hope kind of fun, written to the end rhymes (more or less) of Shakespeare’s sonnet number 18. I wrote this based on an exercise suggested by Bjorn Rudberg’s prompt on Real Toads about using end rhymes of a specific poem. I did not use the last two rhymes of Shakespeare’s sonnet as they rely on “thee,” so had a great excuse to go my own way. 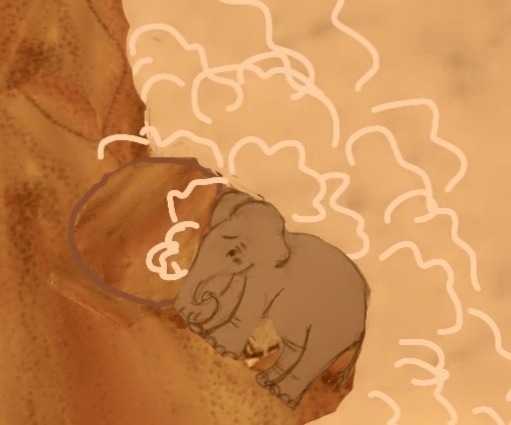 Pic is old one of mine of elephant influenced by Sisyphus–I don’t really mean the lover in the poem to seem frustrated–just liked the reference–ha! All rights reserved. Ps-I have been repeatedly editing the first line since posting. I still don’t know that it is getting my meaning across but here it is for now. This entry was posted on June 3, 2015 at 10:06 pm and is filed under elephants, poetry. You can subscribe via RSS 2.0 feed to this post's comments. Jamie, thanks. I realize I had Sisyphus and the rock reversed but fixed it just now on reading your comment! K.
I had to come back and read it again. Either I didn’t notice or I switched it myself in my head . . . and i note now that there’s just one elephant. Old lady eyes! Ha. I realized I still wasn’t getting at what I was aiming for in first line, so edited again. No reason to come back–perhaps it shows that writing in the middle of the night is not ideal! Thanks. k.
The first line gives me the idea that at the end of the day, Sisyphus catches a break from his task of rock-pushing, as if the rock suddenly locks into a spot on the hill and goes neither forward nor back…just my reading. I love that I was able to identify your source, yet each of your own rhymes and lines seemed totally fresh and full of their own meaning. I esp liked climbing the light of the limbs and all those long-i words which are so savory–also, I really felt the volta here in the treeless shade–those are so hard for me to do–and the end very natural feeling and right. You really did an excellent job with this exercise, but beyond that, the poem itself stands on its own. Thanks. Yes, that’s what I was aiming for with first lines though of course Sisyphus is not intended to be a character here. Maybe the drawing — one I recycled makes it more confusing. I also had a different first line originally where I used words I liked but really had the concept reversed. Thanks for your reading. It was fun to use the shakespeare– one of those poems that seeps into the cultural underlayer– at least of those of us lucky enough to have that kind of exposure. K.
This was fun and some playfulness,which is what I love of Shakespeare anyway. Those that know a tree less shade. I think the Sisyphus line is a good set up but I see what you mean. The ending made me smile. It was tongue-in-cheek. Thanks.